I write this from the Cathedral House in Newcastle, to share news with you about what has happened here, so far. How proud, all of us should be, for the wonderful ceremonies in the name of Father Ambrose that we have seen, for the Reception of his body into Church, Mass on the evening of the feast of Saints Peter and Pauls, and then our Requiem Mass this Thursday morning. Each one was a bright little jewel, in its own right, and a moment of God. These events show how God is working in, and among us, and show us how to continue to put our faith in God, as Fr. Ambrose did so confidently, right up to the last moments of his life. It was only later, I heard, that people were disposed to clap – in honour and gratitude, I imagine – as Fr. 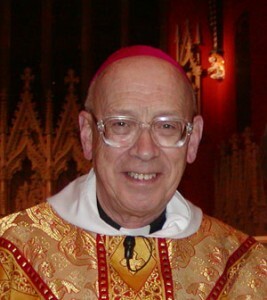 Ambrose’s body was leaving Broadfield, in the hearse: I, personally, have never known that to happen, except in St. Paul’s, outside the walls, when the very saintly Chiara Lubich, was carried out of the Basilica, and it was a great joy (and surprise) to hear that this had happened in Leyland. Certainly, he was a man close to God – and, therefore, close to people. At 7.00 pm yesterday, his coffin was carried into the Cathedral, here in Newcastle. I am almost sure that, in the hearse, I saw the beautiful white cross of flowers, from all the Parishioners of St. Mary’s. Mounted on a pillar at the Cathedral front, there is a huge photograph of Fr. Ambrose, for all to see, and this makes his presence felt, even more – should that be possible. In number, 40 or so, priests concelebrated with the Bishop, and the aisle of the Cathedral was full. The Abbot, Canon Tony Griffiths and myself were given places of honour, as we took our seats, typical of the graciousness of the Newcastle Church; we were among the few wearing full vestments, and were asked to pray the parts of the Eucharistic Prayer. The people prayed for Bishop Ambrose and his family, for the diocese he loved, but also for the parishioners at St. Mary’s, Leyland (a million miles away from the experience of people up here); not so surprising, really, since they realise that so many of us loved Fr. Ambrose, who was not just our Pastor as Parish Priest, later as retired Bishop, but also our personal friend. Bishop Seamus Cunningham preached a well-crafted sermon, similar in its theme to the sermon of Fr. Abbot at Leyland, emphasising Fr. Ambrose’s extraordinary humility, kindness and constant encouragement of people. What struck me was the link that Bishop Seamus made with the great saints of the north-east, St. Aidan, St. Bede, St. Cuthbert and others who are felt to be alive, still, up here; he seemed to imply that Bishop Ambrose had continued, in the same vein, as his predecessors, perhaps emphasising this because Fr. Ambrose was also a monk, and so much loved in the diocese. After a beautiful Mass, with excellent music – the Cathedral choir are very good indeed – we, clergy, retired for some food; people prayed quietly for 45 minutes, until ‘Compline’ which brought the day to a close. As I write, the people are gathering, in numbers, for the Requiem Mass that is due to begin at 12 noon. Apparently, Archbishop Vincent Nichols, the Apostolic Nuncio and other bishops will be present. This evening, Friday, there will be a reception of Father’s body, at Ampleforth, and on the morrow, Saturday 2nd July, the Funeral Mass will begin at 11.00, followed by his burial in the vault, close to the Abbey Church. May I thank all, who did so much to get everything ready, for the three liturgies at Leyland, held for Bishop Ambrose. This includes every aspect, preparation beforehand, the ceremonies (servers, singers, flowers, cleaners of Church and candle sticks and everything, the wonderful refreshments, the publishing and printing of the booklets, readers, car park attendants and those who carried the coffin, together with the undertakers, who made it all so easy for us; all these, and anybody I may have left out!). May we all grow in our love, as we continue our journey, in faith, after this unique experience, we have lived. Rarely in one’s life does one experience the sort of heart-rending, heart-touching events that have occurred in Leyland in the last few days? I have no doubt that, even now, they are being repeated in the Hexham and Newcastle Diocese. Most surely, they will be repeated again tomorrow, Saturday, at Ampleforth. I say ‘rarely’, and advisedly so, for perhaps that is God’s way of giving us something very precious to punctuate our lives. If it were to be that they happened more often, then their very special meaning – and the lessons we learn from them – would lose much of their impact. Father Ambrose was a very special kind of man – monk, priest and bishop. The evidence from the last few weeks – the services in Leyland, Newcastle and Ampleforth, the tributes that have been paid in spoken and written form, personally, documented, and those that have found their way to the Internet – all speak of a very much beloved friend and pastor. We shall not see his like again. When I heard that Father Ambrose had died – quite peacefully on the afternoon of Tuesday, 14th June, this year – my response was immediate and spontaneous, to the effect that there was now no further need to pray for him, as he was no longer suffering the long and painful good-bye to this mortal coil, but was now in heaven, with Jesus, the love of his whole life. Father Ambrose now looks down on all of us who loved him – we are now in his thoughts and prayers, as we were when he lay on his death-bed – as we were when he said his good-bye to his Parish from his wheel-chair, on the weekend of the 4/5 June; few will ever forget his words of encouragement, of love, and of prayer for us all – and this despite his pain, his weakness and in the full knowledge of his impending death. As I said just a little while ago, we shall not see his like again! But, we can all be grateful to Father, (and to Almighty God), for his life, for his character and the gifts that he had in plenty; more than this, we can be grateful for the example he leaves us – one of love, unending, for the Holy Trinity, for Our Lady and for the saints he has now followed – to a life of eternal peace and happiness in heaven. What more can one say, except perhaps, thank you, dear Father Ambrose. God bless!